As a child, Halloween was a lot simpler. There again in the early 1970’s with one TV channel (RTE 1), the ability of advertisers or foreign TV shows to influence our daily lives was much less than today. Although they are very different countries between then and now, perhaps the most striking change is in how we celebrate Oiche Samhain. Oiche Samhain derives from the old Irish word for end of summer, marking the move from light into the darkness of winter. It also marked the end of the harvest. The name Halloween is of Scottish origin, a shortening of the term All Hallows Evening – Hallows relating to saints – the evening before all saints day on Nov 1st. As children we were told that on Oiche Samhain the souls of the dead came out to visit. We should dress up and cover our faces when going out so as to confuse them and avoid capture. The first sign of Halloween then was not an add on TV but the making of masks in the week before it in Faithlegg NS, as part of our arts and crafts activities. Corn flakes boxes would have been the primary source of cardboard. The process was simple. The scholar made out their design on the inside of the cereal box, cut out the eyes and coloured the mask to their own preferences. The more artistic might add horns or pointy ears, and a piece of elastic or string finished the piece so that it would hang in front of you face. If memory serves it would take the whole week and as we went home for the midterm break, the mask would be worn home. On Halloween night the mask along with an old coat or a big sack would be thrown over us and we went out to the bonfire. I don’t recall going Trick or Treating as it would be known now, though I do remember going to a few houses on occasion. You would knock on the door and would be expected to entertain with a song generally. In those times you got an apple and some nuts…No sweets, no money, no crisps, no drinks! Given that we had loads of windfall apples at home and bags of nuts, getting more hadn’t a great appeal. Home was always busy on Halloween. Mind you houses weren’t decked out in the way we decorate for the event now. The day passed slowly as a child, as you had to wait for dark for the festivities to begin. Barmbrack would be eaten, my mother hadn’t always the time to be baking and she sometimes got a brack from Portlaw bakeries who delivered to my aunt Ellen’s shop in the village. The brack would have a coin, a stick and a ring. I always wanted the coin needless to say. My father would make up a snap apple with two pieces of timber crossed over with pointed ends with apples pushed on. It was suspended by string and it was a difficult balancing act to get right. We then stood with hands behind our backs and tried to catch an apple in our mouth, always mindful of not biting on others spit-filled fruit. Another activity was the money in a water filled basin. Again hands behind your back you had to submerge your head into the water and try get the coin off the bottom of the basin. Generally impossible, but given how scarce money was, worth almost drowning yourself . Of course there were also ghost stories and my father could always be relied upon to scare half the avenue with ghoulish tales, like the one I related last year about the Banshee at Coolbunnia. I not sure when pumpkins became popular but I can remember trying to carve out a turnip on occasion and the pain in our hands from the time it took. 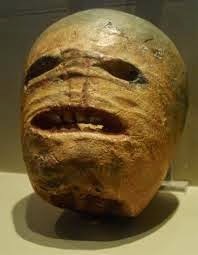 Apparently when the Irish emigrated to America the tradition of carving a turnip went with them. However, it was replaced when the local pumpkin proved to be much easier to hollow out and carve. The turnip below certainly looks more malevolent. The big part of the night of course was the fire. In those days the bonfire happened in the Knock behind the Mount Avenue council houses and so we could wait until we saw the night sky light up before we went over, particularly if it was raining. The fire was magical and we danced round it as children, not realising we were celebrating and re-enacting an ancient tradition. Next morning was All Souls, a holy day of obligation, and an important festival to mark also. Our mother would be up earlier than usual to clean clothes and have us all scrubbed clean of smoke before we headed to mass. All told it was a much more simpler time. Very different from the commercial affair that marks the night now. But it’s interesting to note, than although commercialised and much changes, it’s still a ancient Celtic festival to which we have a deep connection and hopefully continues to be part of out traditions. This piece this morning is an edited and updated piece I first published on Oiche Samhain 2014. 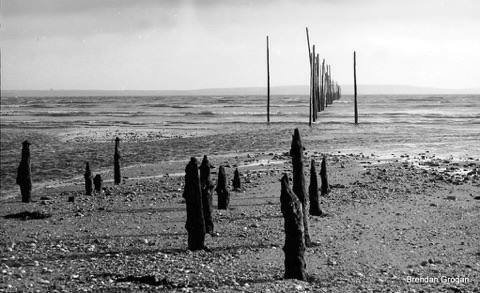 Woodstown weir, circa 1960. Sense of the size of it. tides and all weathers (the weekend closure was still enforced however). 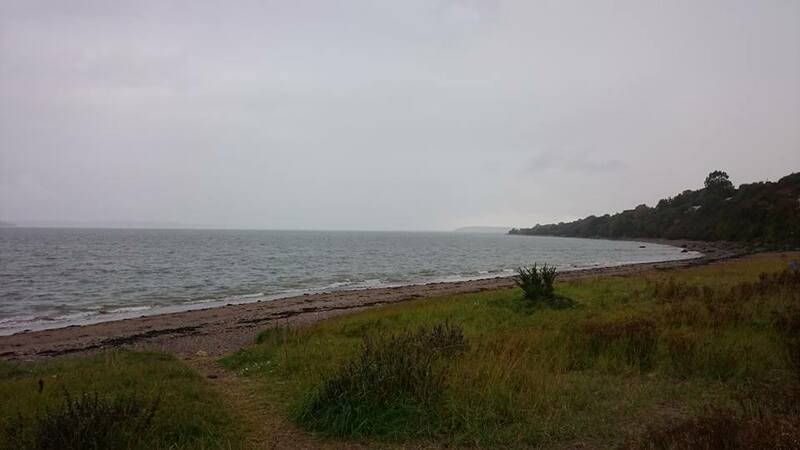 The basic design was as depicted at Woodstown. 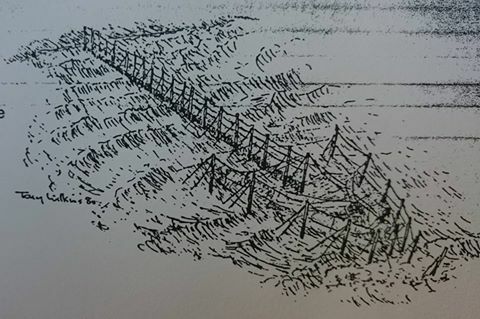 nets-men may have complained, initially the weirs were erected unopposed. with netting attached ot the leader. I.A. The Tay Salmon Fisheries since the 18th C. 1998. Cruithne Press. As part of this years Imagine Arts Festival, Deena and I were asked to lead a walk in our local community on a theme reflecting our heritage and arts. To do this we thought about the many songs, stories, poetry and prose that surround our area and reflect our rich maritime heritage. 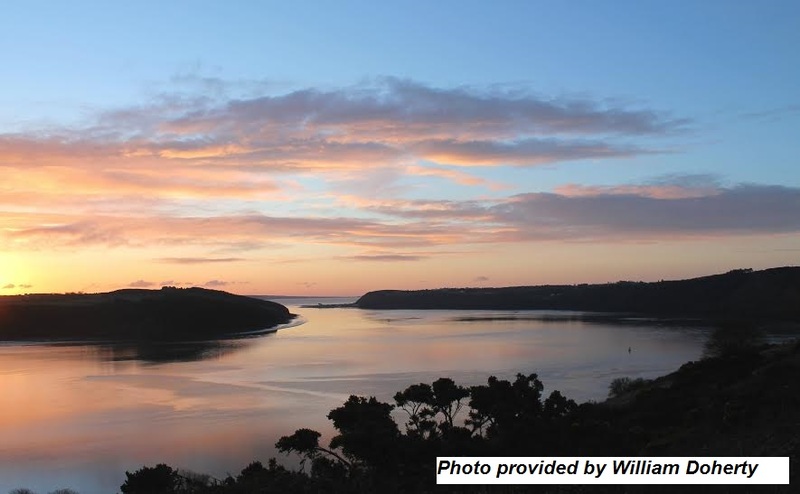 So the walk that departs this morning from Faithlegg Church at 11am is a walk that celebrates the big river, or more accurately rivers ( Barrow, Nore and Suir), that inspire and continually enrich our lives. Our history stretches long back into antiquity. 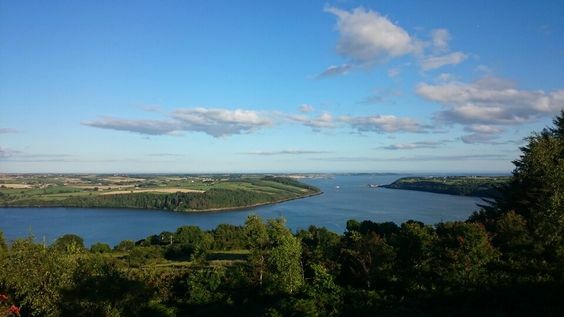 Gael, Viking, Norman and English have entered the harbour here and used it as a route to open up the entire country. When Ptolmy drew a map of the known world in 2 AD he included Ireland, and a River Birgos, long considered the Barrow. 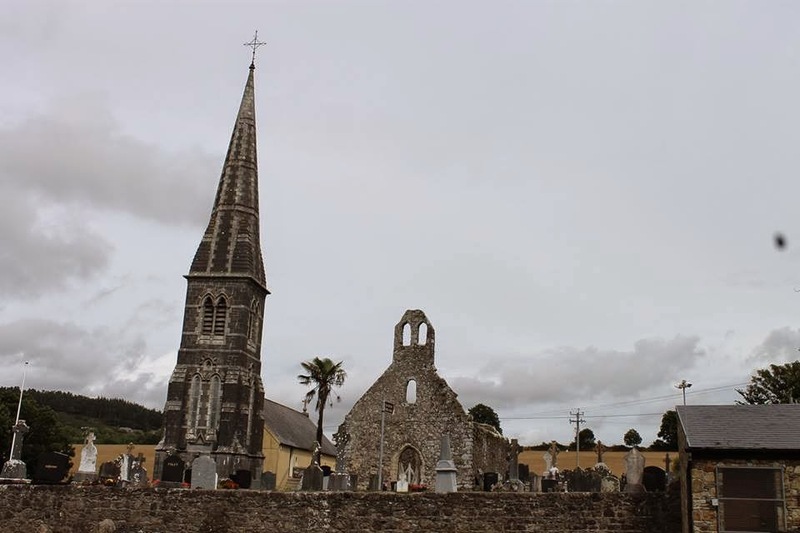 The parish of Faithlegg itself was gifted to a Bristol merchant named Aylward following the entry of King Henry II through Waterford this past week in 1171. 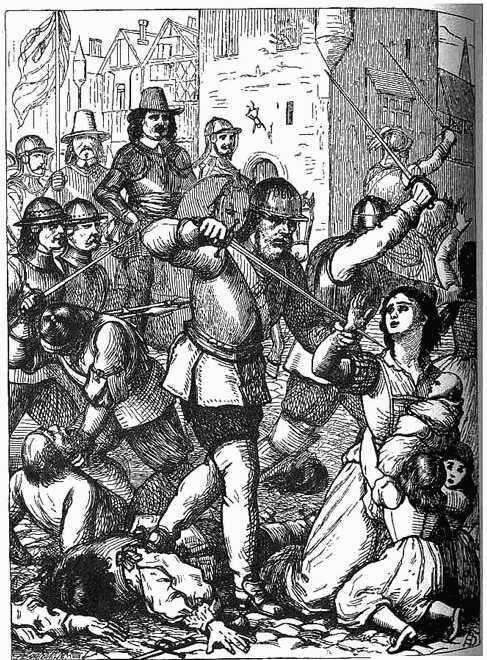 Those Bristol men played a significant role in the development of the port, as did the Norman knights and religious orders that followed. The Aylwards managed to weather many political storms until the arrival of Cromwell put and end to their reign of the area, when it passed to the Bolton family. The last Bolton, Cornelius left us Faithlegg House which he sold to the catholic Powers in 1816. We have the powers to thank for the modern church. 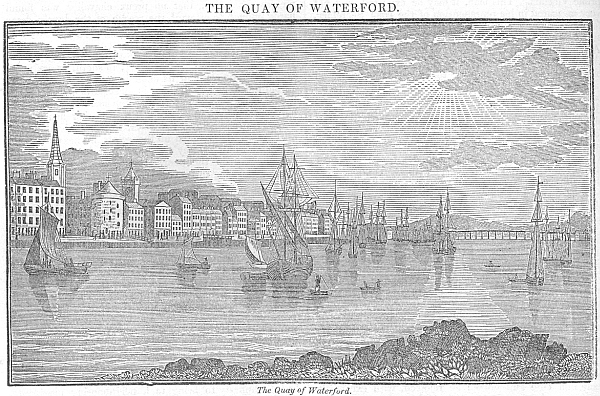 Throughout these times Waterford continued to trade and prosper. 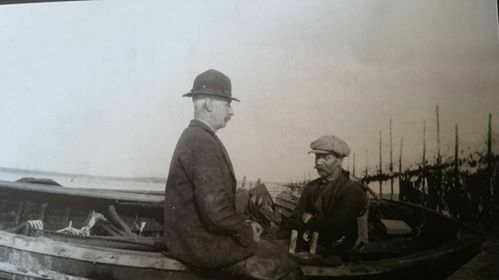 “The number of people who go as passengers in the Newfoundland ships is amazing; from 60-80 ships and from 3000 to 5000 persons annually. They come from most parts of Ireland; from Cork Kerry etc. Experienced men will get £18 to £25 for the season, from March to November; a man who never went will have £5 to £7 and his passage, and others rise to £20, the passage out they get but pay home £2. An industrious man in a year will will bring home £12 to £16 with him, and some more. A great point for them is to be able to carry all their slops (work clothes)for everything there is extremely dear, 100 or 200% dearer than they can get them at home. They are not allowed to take out any woollen goods but for their own use. The ships go loaded with porrk, beef, butter, and some salt, and bring home passengers, or get freights when they can; sometimes rum. 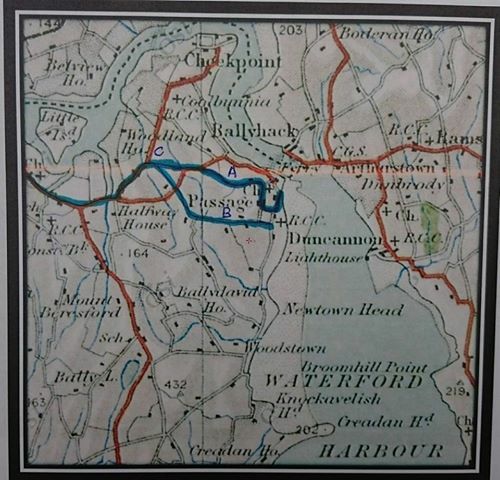 So Waterford as a city and the rivers that formed her harbour were a busy and prosperous place at this point, and it would continue to flourish long into the following century. But a variety of circumstances began to undermine that prosperity and I’m probably guilty of a lot of nostalgia in what I write when I reflect weekly on where we are now, not just as a city, or a port but also our once rich fisheries. When ever I hear the Jimmy Nail song Big River, it stops me in my tracks as I listen to his elegy for the hard work and vitality that was the River Tyne and its heavy industry. I don’t get any sense of what the future of the Tyne is in it however (lyrics here). But I do get a sense of a future in our rivers. Our walk this morning is not meant to be nostalgic. It’s meant to communicate the rich history and heritage imbued in the buildings, pathways and vistas that surround us. Its meant to explore what they once meant and what the yet might become. It is story, song, poetry and prose of a past, a present and hopefully a future. This coming week will see another significant historic anniversary. For on the 16th October 1171 Henry II launched his fleet which beached on the 17th at Crooke in Waterford Haven as the harbour was then known. As he stepped ashore he became the first foreign king to do so and it represented the loss of our country’s sovereignty which would endure for 750 years. * I’ve also seen a smaller figure of 240 mentioned but most sources quote 400. I’ve read no analysis of the figures. ** Again 4,000 troops is mentioned as a minimum in almost every account. Some add 500 knights to it, others add attendants, squires etc. It’s possible the 4,000 actually covers the entire entourage including ships captains and crews, which would diminish the actual invasion force considerably. Any walk we ever do that includes the Minaun and its stunning views, invariable leads to a mention of Oliver Cromwell and his vow to take Ireland by Hook or by Crooke. Looking out the harbour we have the Hook peninsula in Co Wexford on the left and Crooke below Passage East Co Waterford on our right. I’m regularly challenged by well informed walkers who opine that of course Cromwell was not the originator of the phrase at all. The fact is there are many different origin accounts, but not much agreement. A less popular account considers it the means of paying taxes, or tithes to the Manor. You could pay through the growing and harvesting of crops or by raising and keeping animals. In either case part of what you reaped with a hook, or made from the animals was forfeit to the manor. As the essence of the phrase is that something will be done by any means necessary I personally lean towards this account. But I don’t have much support in that. The “scholars” on internet tend to agree that the phrase is an ancient one, and was used commonly by the 14th century as a expression with the same meaning as in modern usage. As a consequence even if Cromwell didn’t coin it to describe his invasion plan it would be a difficult point for anyone to argue that he didn’t employ such a common phrase as an expression of intent. And perhaps, or maybe even, surely, he reflected on the curious geographical similarity once he arrived. I have a great meas on local lore!